The TV Ratings Guide blue bloods cbs cbs renew/cancel watch code black criminal minds csi: cyber elementary hawaii 5-0 life in pieces limitless madam secretary mom ncis new orleans ncis:la scorpion supergirl the good wife CBS Renew/Cancel Watch: 'Code Black' Still Certain to be Canceled... Maybe? 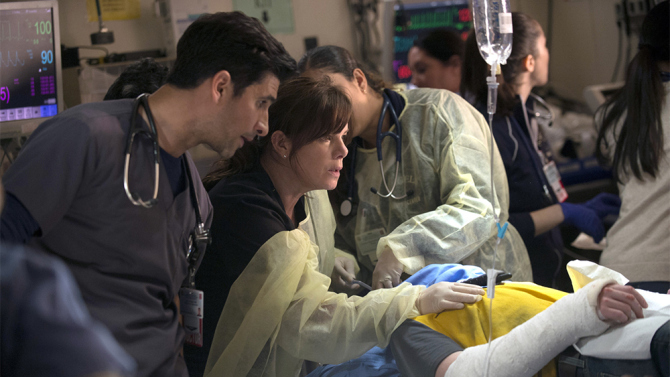 CBS Renew/Cancel Watch: 'Code Black' Still Certain to be Canceled... Maybe? Welcome to the CBS Renew/Cancel Watch of the fall season! All scripted, primetime shows are included in the prediction table below once they have premiered for the season. An analysis of any new prediction changes follows. My current predictions are as of December 5, 2015. It's been a slow week at CBS with only six scripted series airing original episodes (Madam Secretary, The Good Wife, Supergirl, Scorpion, Criminal Minds, and Code Black). Thus, there is little new data to work with. While no changes have been made to the prediction statuses above this week, there are a couple of shows worth analyzing as we head into the final month of 2015! The medical drama, which has been standing quite firm on a 1.2 streak since its premiere, rose last week to a 1.4, despite airing on a Thanksgiving Eve that saw some big drops across the board. However, it didn't air against Nashville or Chicago PD, its usual 10PM comps. The show posted a 1.5 this week, tying its series premiere/high. Again, it didn't have Chicago PD to air against, but it did compete with Nashville, which, in all fairness, was its same old weak self at a measly 0.9 for the hour. Still, a 1.5 is a commendable result considering its track record and that it was only a tenth under its lead-in (Criminal Minds: 1.6). In the bigger picture, CBS doesn't seem to have much faith in the series, giving it only a 5-episode backorder to bring its total episode count to 18. On top of that, it's off the schedule by late February and will be replaced by Criminal Minds: Beyond Borders for midseason. Limitless, Supergirl, and Life In Pieces seem to have been given better treatment by the network, with each one scoring more episodes than Code Black. Until it faces its regular competition again in the hour, there's really no telling if the show is experiencing a legitimate growth pattern, or simply benefitting from the lack of competition (the latter being more likely). The odds are against this show as it stands, and it's possible it's attempting to speak up too little, too late. I recently moved the show down to The Bubble in light of its poor downward trend, as it has clearly taken a drastic tumble from its 3.1 premiere. With a track record of 3.1 / 2.1 / 1.7 / 1.8 / 1.5 / 1.6, it remains to be seen where this one is ultimately settling, but it's still likely to head into the unflattering territory of low 1s by the end of the season. With 20 episodes now being produced, and still being CBS's #1 new drama, I don't see it necessarily having the super-reach chances at a renewal that some might suggest, but definitely not comfortable ones either. The show does have tough competition from The Voice and Gotham on Mondays, and if CBS is keen on the idea of bringing back two freshman dramas, and Code Black's growth turns out to be a fluke, I see Supergirl holding the second best chance, second only to Limitless. The main factor working against it is that CBS doesn't own it, whereas they have stakes in Limitless and Code Black. Thus, a shortfall in ratings isn't as easily defendable. It's been a highly-touted asset for CBS since its pick-up, but it no doubt fell on its face as the hype has worn off and the ratings have failed to meet expectations. Yet, nine dramas have hit 1.3 or lower for CBS so far this season, and Supergirl is one of five that hasn't stooped that low yet. Again, give it time and it almost assuredly will. Where does this puzzle piece end up? We'll see how the season goes, but it could easily go either way. What do you think CBS should do with Code Black and Supergirl? Is the growth for Code Black solely due to the lack of competition, or will it pull out a miracle renewal? Share your thoughts with me below!